If you believe my Twitter profile, I was forced to leave Brooklyn kicking and screaming. If you saw the kitchen that I get to cook in now, you would know that’s not exactly the whole truth. Earlier this year, we packed up our house and moved our family across one bridge, two rivers and one tunnel from Brooklyn to Hoboken. We traded in our New York licenses for New Jersey licenses, more space, a back yard and a huge kitchen with a bay window and skylight. The short story? It had me at the kitchen. After years of (good natured) knocking on Jerz, I’ve been spending the last few weeks biking up and down the Jersey side of the Hudson River marveling at how beautiful it is here. Plus, Hoboken has a small town feel where people remember your name and you go to one store for fresh bread and another for a still warm twist of mutz. Our neighbors all know each other – in a nice, not creepy way – and some evenings, I take the ferry home from work leaving behind the busy city with wind in my hair and the wafting smell of the water around me. In short, I love Jersey. What – was that my out loud voice? Yes, it’s true. I love Jersey – well, at least my little corner of it in Hoboken that I’ve been busy exploring. After a scenic ride from Hoboken north past Port Imperial, I returned wanting something filling, warm and healthy. 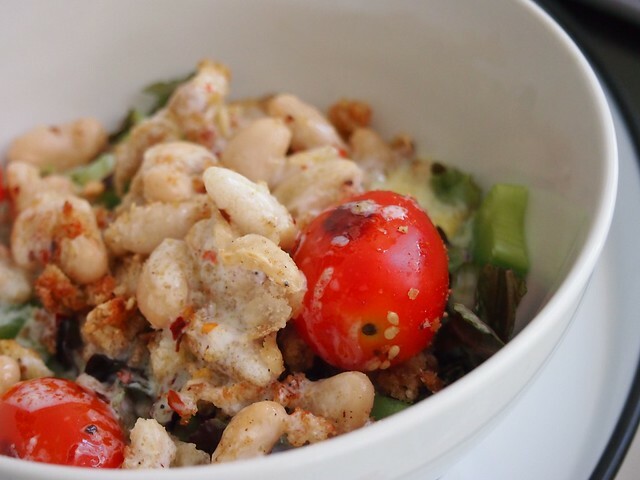 This bean salad came together as the perfect combination of crunchy, creamy and salty. I cooked the tomatoes in the middle of the skillet covered with a smaller lid to help them get toasty on the inside and slightly charred on the outside. Ideal for a warm summer day with a glass of rose. Heat about one tablespoon olive oil in a skillet. Add the panko crumbs and sautÃ© for 3-4 minutes until golden. Mix in the parmesan cheese. Mix in the white beans and cook another 2-3 minutes. Sprinkle with dukkah. 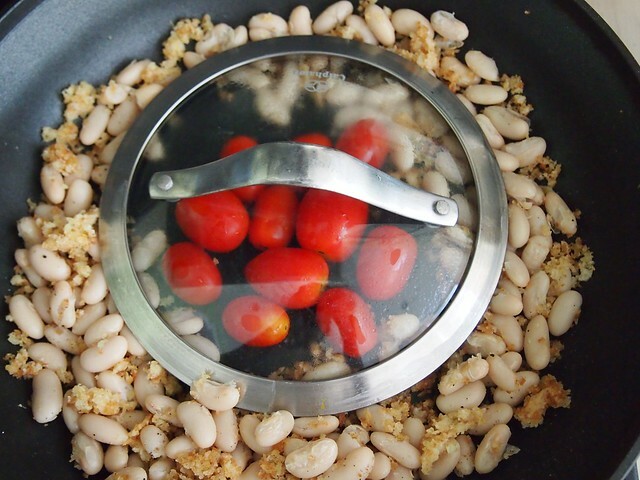 Create a well in the middle of the beans and add tomatoes. Cover the tomatoes with a smaller sized lid and cook another 4-5 minutes. Shower with salt and pepper. Make the sauce by placing ing all of the ingredients in a small tupperware or jar. Shake well. 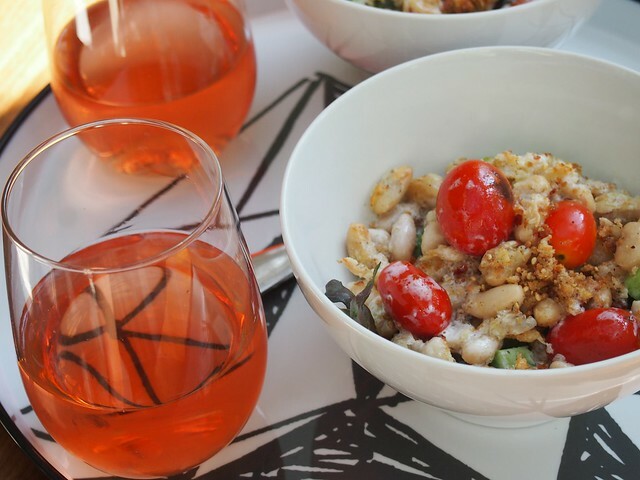 Serve warm bean and tomato mixture over a bowl of shredded lettuce with a handful of celery topped with dressing. Welcome to NJ. I love Jersey for all the reasons you mentioned. We are about 10mins from GWB, yet so far from the hustle & bustle of NY. That salad looks delicious with the crunchy panko coating.